While developing my bedtime routine print I tried these butterflies on my background. I thought it was so pretty I saved it and am sharing it with you now. I used vintage graphics to make this background element for scrapbooking. I laid a scrolly frame over a dictionary page, and put some brown butterflies on top. It has that look almost like an old botanical print with sepia tones. This prints at 8×10, so you could just frame it and stick it on the wall as is, or mount it on regular scrapbook paper. *The little HousePunkery watermark is not on the downloaded image. 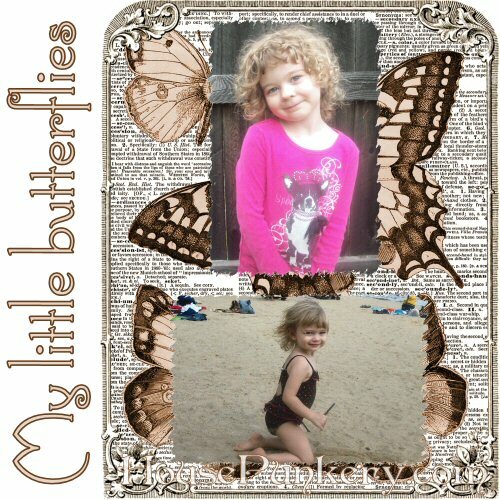 An example of how to use this background for scrapbooking. The font I used is Connie. Shared under creative commons license Attribution-NonCommercial. You can share my work and modify it, but please give me credit. If you would like to use it commercially please contact me. Love this so much you totally need more? Read more about the routines I’m developing for my shop. This is so exciting, but I can’t get the downloads to open, and some are in that weird computer jargon. Please help ! Poo. Was it the PDF file that was in jargon? Beautiful! I’m always looking for scrapbooking items since I need to make First Communion albums for my kids almost yearly.